The luxury D-shape soft-close square edge seat with top-fix and quick release, designed and manufactured by leading bathroom brand Premier. Has top fixing assembly for ease of installation - Particularly useful when access is unavailable to fix seat to pan ie enclosed btw pan or in particular awkward place to fix using the conventional bolt-up-type from underneath. Q. Hi - my existing toilet has the holes for hinges 14cm apart - will this toilet seat fit? Unfortunately, it is difficult to say without the Porto dimensions. However the hinges on this product are adjustable from 125mm-175mm. I hope this is some help, Thank you. Q. Can you please advise the maximum distance between hinges for this item? It is a solid seat and the thermal finish means it is never cold! Great product and easy to clean as well. 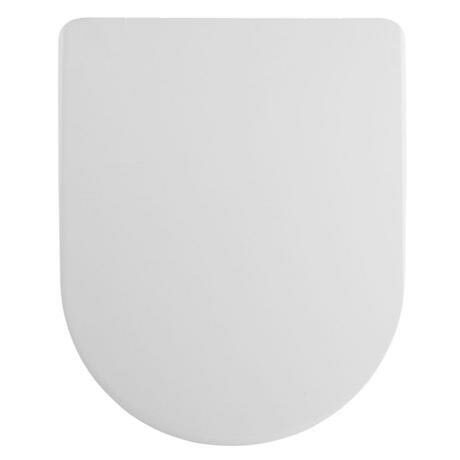 "Very good quality, soft closing toilet seat in exactly the size I was looking for. Very easy website to browse, I will definitely be using this site again." Excellent replacement seat. Easy to fit. "Good product, the some as I needed." Very pleased with our purchase. Fast delivery and easy to install. Would recommend. "Great toilet seat as I usually have to order from bathstore and its £50 from them!! And with postage I only paid £36 and it was here the next day, great service." Product exactly as described. Very sturdy. Good quality and cheaper than elsewhere. Good quality product. Fits easily and clever quick release means easy access to clean toilet.